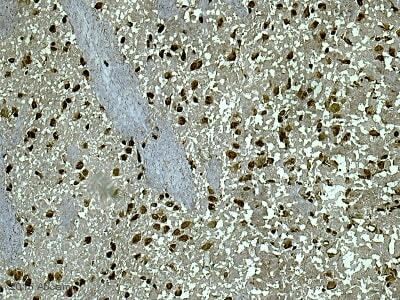 Rabbit polyclonal Dnmt3b antibody. Validated in WB, IP, IHC, ChIP, ICC/IF and tested in Mouse, Rat, Human. Cited in 48 publication(s). Independently reviewed in 5 review(s). This antibody detects DNA methyltransferase 3b (Dnmt3b) from human and mouse tissues and cells as well as recombinant human Dnmt3b. This antibody detects, to a lesser extent, full-length human recombinant Dnmt3a. Synthetic peptide corresponding to Mouse Dnmt3b aa 1-14. P19 nuclear extracts. ChIP: PMID: 16357870 (Vire E et al Nature 2006 439:871) has used U2OS cells and primers specific for the hsMYT1 promoter. The primers are described in PMID: 15231737 (Kirmizis A et al Genes and Dev 2004 18:1592). Our Abpromise guarantee covers the use of ab2851 in the following tested applications. WB Use a concentration of 2 µg/ml. Detects a band of approximately 130 kDa (predicted molecular weight: 97.5 kDa).Can be blocked with Dnmt3b peptide (ab4922). Required for genome wide de novo methylation and is essential for the establishment of DNA methylation patterns during development. DNA methylation is coordinated with methylation of histones. May preferentially methylates nucleosomal DNA within the nucleosome core region. May function as transcriptional co-repressor by associating with CBX4 and independently of DNA methylation. Seems to be involved in gene silencing (By similarity). In association with DNMT1 and via the recruitment of CTCFL/BORIS, involved in activation of BAG1 gene expression by modulating dimethylation of promoter histone H3 at H3K4 and H3K9. Isoforms 4 and 5 are probably not functional due to the deletion of two conserved methyltransferase motifs. 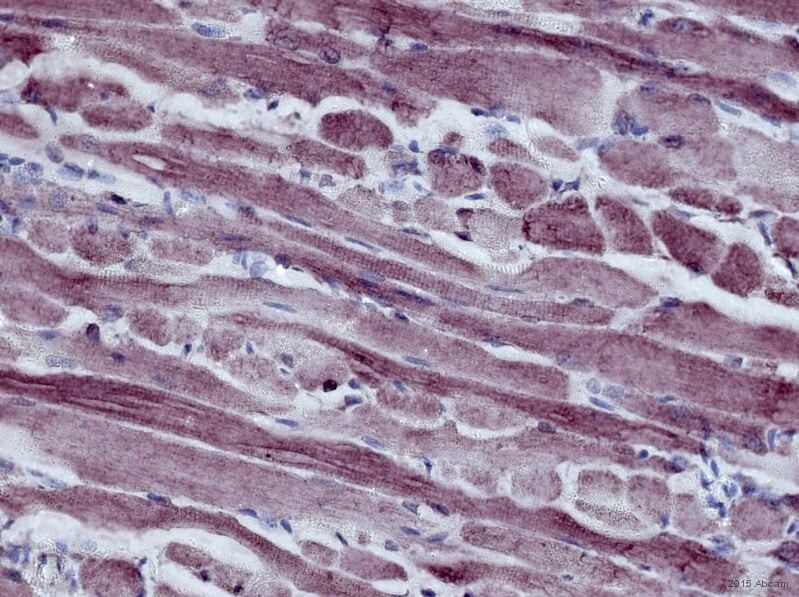 Ubiquitous; highly expressed in fetal liver, heart, kidney, placenta, and at lower levels in spleen, colon, brain, liver, small intestine, lung, peripheral blood mononuclear cells, and skeletal muscle. Isoform 1 is expressed in all tissues except brain, skeletal muscle and PBMC, 3 is ubiquitous, 4 is expressed in all tissues except brain, skeletal muscle, lung and prostate and 5 is detectable only in testis and at very low level in brain and prostate. Defects in DNMT3B are a cause of immunodeficiency-centromeric instability-facial anomalies syndrome (ICF) [MIM:242860]. ICF is a rare autosomal recessive disorder characterized by a variable immunodeficiency, mild facial anomalies, and centromeric heterochromatin instability involving chromosomes 1, 9, and 16. ICF is biochemically characterized by hypomethylation of CpG sites in some regions of heterochromatin. ab2851 labellling Dnmt3b in the nucleus of Mouse brain tissue (right) compared with a negative control (left) by Immunohistochemistry (formalin/PFA-fixed paraffin-embedded sections). To expose target proteins, antigen retrieval method was performed using 10mM sodium citrate (pH 6.0) microwaved for 8-15 min. Tissues were blocked in 3% H2O2-methanol for 15 min at room temperature, washed with ddH2O and PBS. Tissue sections were incubated with primary antibody (1:200 in 3% BSA-PBS) overnight at 4°C. A HRP-conjugated anti-rabbit was used as the secondary antibody, followed by colorimetric detection using a DAB kit. Tissues were counterstained with hematoxylin and dehydrated with ethanol and xylene to prep for mounting. ab2851 labellling Dnmt3b in the nucleus of Human testis tissue (right) compared with a negative control (left) by Immunohistochemistry (formalin/PFA-fixed paraffin-embedded sections). To expose target proteins, antigen retrieval method was performed using 10mM sodium citrate (pH 6.0) microwaved for 8-15 min. Tissues were blocked in 3% H2O2-methanol for 15 min at room temperature, washed with ddH2O and PBS. Tissue sections were incubated with primary antibody (1:500 in 3% BSA-PBS) overnight at 4°C. A HRP-conjugated anti-rabbit was used as the secondary antibody, followed by colorimetric detection using a DAB kit. Tissues were counterstained with hematoxylin and dehydrated with ethanol and xylene to prep for mounting. ICC/IF image of ab2851 stained HepG2 cells. The cells were 100% methanol fixed (5 min) and then incubated in 1%BSA / 10% normal goat serum / 0.3M glycine in 0.1% PBS-Tween for 1h to permeabilise the cells and block non-specific protein-protein interactions. The cells were then incubated with the antibody (ab2851, 1µg/ml) overnight at +4°C. The secondary antibody (green) was Alexa Fluor® 488 goat anti-rabbit IgG (H+L) used at a 1/1000 dilution for 1h. Alexa Fluor® 594 WGA was used to label plasma membranes (red) at a 1/200 dilution for 1h. DAPI was used to stain the cell nuclei (blue) at a concentration of 1.43µM. ab2851 labellling Dnmt3b in the nucleus and cytoplasm of Human breast carcinoma (right) compared with a negative control (left) by Immunohistochemistry (formalin/PFA-fixed paraffin-embedded sections). To expose target proteins, antigen retrieval method was performed using 10mM sodium citrate (pH 6.0) microwaved for 8-15 min. Tissues were blocked in 3% H2O2-methanol for 15 min at room temperature, washed with ddH2O and PBS. Tissue sections were incubated with primary antibody (1:500 in 3% BSA-PBS) overnight at 4°C. A HRP-conjugated anti-rabbit was used as the secondary antibody, followed by colorimetric detection using a DAB kit. Tissues were counterstained with hematoxylin and dehydrated with ethanol and xylene to prep for mounting. Additional bands at: 32 kDa, 46 kDa. We are unsure as to the identity of these extra bands. Publishing research using ab2851? Please let us know so that we can cite the reference in this datasheet. I'm using ab13604 in WB but seeing bands at 130 and 180 kDa and nothing at the expected 95 kDa. I would like to try ab2851. I am sorry this product did not perform as stated on the datasheet and for the inconvenience this has caused. As requested, I have issued a free of charge replacement with ab2851. This will actually ship today and you should receive it tomorrow. LOT NUMBER XXXX ORDER NUMBER XXXX DESCRIPTION OF THE PROBLEM No signal or weak signal SAMPLE RAT NORMAL EMBRYO , total protein PRIMARY ANTIBODY Concentration or dilution 1:100-1:400 Diluent buffer 1:10 of blocking Incubation time O/N Incubation temperature 4°C Washing: Buffer Used PBST Number of washes 6 washes WITH 5 MINS CHANGE DETECTION METHOD ECL advance POSITIVE AND NEGATIVE CONTROLS USED Positive control NA Negative control NA ANTIBODY STORAGE CONDITIONS -20degC SAMPLE PREPARATION Lysis buffer RIPA Protease inhibitors COMPLETE PROTEASE Phosphatase inhibitors - Reducing agent DTT, MERCAPTO Boiling for ≥5 min? YES AMOUNT OF PROTEIN LOADED Protein loaded ug/lane or cells/lane 40ug ELECTROPHORESIS/GEL CONDITIONS Reducing or Non Reducing gel REDUCING Percentage of gel 10% Volts applied 100V Time applied 60-70 mins TRANSFER AND BLOCKING CONDITIONS Type of membrane NC Protein transfer verified YES Blocking agent and concentration 5% blocking provided in ECL advane kit( from amersham) Blocking time 1 hr Blocking temperature RT SECONDARY ANTIBODY Species Swine Reacts against Rabbit Concentration or dilution 1:10,000 Diluent buffer 1:10 of blocking Incubation time 1 hr Incubation temperature: RT Fluorochrome or enzyme conjugate HRP Washing: Buffer Used PBST Number of washes 10 washes WITH 5 MINS CHANGE HOW MANY TIMES HAVE YOU TRIED THE APPLICATION? 2 HAVE YOU RUN A "NO PRIMARY" CONTROL? No DO YOU OBTAIN THE SAME RESULTS EVERY TIME? Yes WHAT STEPS HAVE YOU ALTERED? Changing protein Concentration, blocking %, primary antibody dilution from 1:100 to 1: 400, secondary antibody dilution, washing time etc, ADDITIONAL NOTES The another antibody received with above mentioned (i.e. anti-SP3) worked fine with the same sample and same protocol indicating that there is no problem with the sample or protocol and secondary Ab. Thank you for contacting us and taking the time to send the questionnaire. We really appreciate all the details provided as well as the images sent, that help us to better understand the problem. All of our products are covered by our Abpromise guarantee; which ensures that you can trust our products, and they should work in the tested species and applications stated on the datasheet, or we will offer a replacement, credit, or refund, if reported within 6 months of purchase. I would really like to help you solve the problem and obtain good results from this antibody, and for that I am very pleased to give you some protocol tips. In the case these suggestions don’t improve the results, please let me know, and I will be happy to send a replacement or a credit note. -In order to enrich the signal, prepare nuclear lysates to increase the protein levels in the sample. -During sample preparation, it is crucial to use protease inhibitors as well as phosphatase inhibitors to avoid sample degradation. -I would suggest trying a different blocking agent. Have you tried 5%BSA for 1-2 hours at RT? -Decreasing the secondary concentration may also help to improve the signal. -To avoid smearing of the gel, using fresh prepared buffers is crucial. - You may run a positive control to assess how well the antibody is working. This protein is highly expressed in JEG-3 lysates. I hope these tips help, thank you for your cooperation. Should the suggestions not improve the results, please do not hesitate to contact me again, and I’ll be more than happy to help you further. My apologies. I was not being clear. I need a good positive control target for anti-DNMT1 ChIP. Our customer confused about the molecular weight you mentioned. They found that all referneces they searched showed that the molecular weight of this protein is ~130 kDa. The attachment file is the reference which were published in Vol. 439 at Feb 16 last year. This data is very important for our customer to carry on their research. We would be appreciated if you could help them elucidate this case, thank you! Thank you for getting back in touch with me. To clarify. A predicted molecular weight of 97KDa for Dnmt3b is derived from SwissProt reference Q9UBC3. This is purely based on the protein sequence and a prediction. ab2851 detects a band of approximately 130 kDa which correlates with the Dnmt3b reference that you have provided me with. I can tell you that this antibody also detects recombinant DNNMT3b1 at ~130KDa and recombinant DNMT3b3 at ~100 kDa; this may explain the additional bands. I hope this information helps, please do not hesitate to contact us if you need any more advice or information. I apologize for a delay in my response, but I didn't have a chance to reply before. 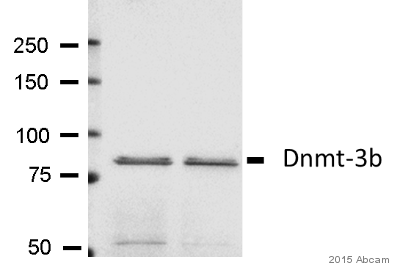 I am sending the photo of the DNMT3B blot, I really don't know what happened with the prevous attachment. So, these are the bands that I am seeing when I use your antibody, upper one (which I believe is specific) is around let say 90 Kd and the lower (probably unspecific one) is around 80 Kda. And to answer your questions... Incubation with the primary antibody was overnight. And, no, I didn't try blocking with BSA with this Ab. I usually try that when I have very weak signal. In this case I have had pretty strong signal with very strong nonspecific band. So, I am sure background would be much more pronounced with BSA than with nonfat dry milk.I didn't find it reasonable to try when I already had very strong nonspecific band. Please let me know what you think about it.